Don’t read this if you are a vegetarian. I was a vegetarian once. Then one day after a hard swim I ate a steak and never turned back. I don’t eat as much meat as your average Joe (Hi, Joe!) but when I eat it, I eat it with gusto and fervor…and usually kale. 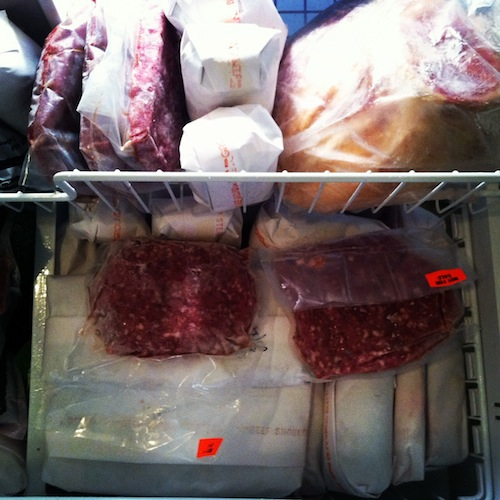 Today we had, delivered to our home, 58 lbs of grass-fed meat. I feel like a celebrity. (I assume celebrities have everything delivered in bulk and frozen. Meat, soup, toothpaste, wigs…) We are really excited about the bounty lovingly stacked in our freezer. Stay tuned to see what it gets turned into. Due to its lower fat content, grass-fed meat cooks differently and requires different prep and cooking techniques than conventional and I intend to investigate these procedures thoroughly. I shall share my failures and victories with you on this site. There is 1/8 of a calf in our freezer! Protein power!